WANTED: Next Great Travel Filmmaker. Will It Be You? 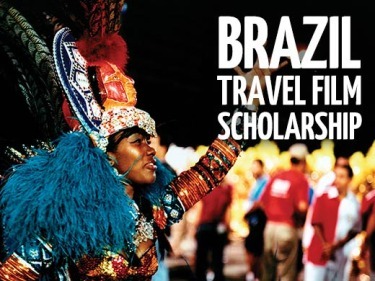 Travel Film Scholarship 2012 - Go on assignment to Rio de Janeiro, Brazil and experience Carnival. Our partners at World Nomads just launched their World Nomads 2012 Travel Film Scholarship. They are looking for talented, aspiring filmmakers and front of camera talent to apply to go on assignment to Brazil with professional filmmaker Trent O’Donnell. The scholarship winner will head off to Rio to experience Carnival, visit a favela project, and experience a farm home stay. The resulting films will be considered for broadcast by Nat Geo Adventure. Check out the opportunity here. Entries close October 15, 2012. The Grand Prize Winner will receive $10,000 and a trip to National Geographic headquarters in Washington, D.C., to participate in the annual National Geographic Photography Seminar. The winning photograph will also be published in National Geographic magazine. Picture this. You are a National Geographic photographer. You have just received an assignment to photograph African wildlife on safari. Now, imagine that you are doing the next best thing – being mentored by renowned Nat Geo wildlife photographer, Jason Edwards, on location in South Africa. Travel safety specialists, WorldNomads.com, has partnered with National Geographic Channel to bring you the 2011 Travel Photography Scholarship to South Africa! This is your chance to photograph in Kruger National Park on an 8-day trip with Gap Adventures. You’ll step into the heart of Big 5 game country with lions, leopards, elephants, rhinos and buffalos, as well as zebras, giraffes, kudus and monkeys…to name a few. You’ll also photograph Cape Town in all its vibrant colour and visit a pre-school community project on the outskirts of Cape Town, offering you a well rounded view of modern South Africa, courtesy of South African Tourism. Your best photos will be published on National Geographic Channel where they will be viewed by thousands of travellers worldwide, offering you a once-in-a-lifetime chance to get your foot in the door of one of the most revered exploration organisations in the world! WIN FREE TRAVEL AND HAVE YOUR PHOTOGRAPHY PUBLISHED IN NATIONAL GEOGRAPHIC TRAVELER MAGAZINE. Have you ever dreamed of having your photography showcased by National Geographic? Or, heading off for a FREE dream vacation? Now you can! Enter the National Geographic Traveler Photo Contest, which just launched today and runs through July 11, 2011. The grand prize is a 14-day expedition for two to the British and Irish isles aboard the National Geographic Explorer (www.NationalGeographicExpeditions.com). The runner-up will win a nine-night hotel stay at Trident Hotels in India (www.TridentHotels.com), and the third prize winner will gain entry to an intensive 2 ½ day photo workshop at Santa Fe Workshops (www.santafeworkshops.com). Entries may be submitted today through July 11, 2011 for a $15 - $25 fee in any of the following categories: travel portraits, outdoor scenes, sense of place and spontaneous moments. Winning images will be showcased in the November/December 2011 issue of National Geographic Traveler magazine. For the past 23 years, National Geographic Traveler has hosted this competition and attracted entries from around the world. In 2010, nearly 4,000 photographers submitted over 11,000 images of wildlife, destinations and people that evoked a sense of discovery and exploration. You can find more information on the National Geographic Traveler Photo Contest by visiting http://travel.nationalgeographic.com/travel/traveler-magazine/photo-contest/. If you have a traveler’s eye for photography, this could be your ticket to wander. 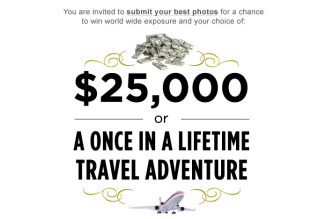 $25,000 or A Dream Trip Around the World and more. Everyone loves those marshmallow peeps that make their way into stores right about Easter time. It certainly appears that the folks at National Geographic love them, and have launched a really fun photo contest once again in 2010. Dubbed Peeps in Places, I think they’re trying to create the ultimate travel “peep show”, and if this year is like other years, you will be so amused at the great photos of peeps around the world! Pink Peeps in Portland. Photo by John Frazier.Check out the photo gallery of peeps to see some of these adorable Easter mascots all dressed up to capture the theme of the place they’re vacationing. Some of these photos are perfectly “peeposterous”. Next time you’re traveling, be sure to take your peep too, and maybe you will be published on NationalGeographic.com too.